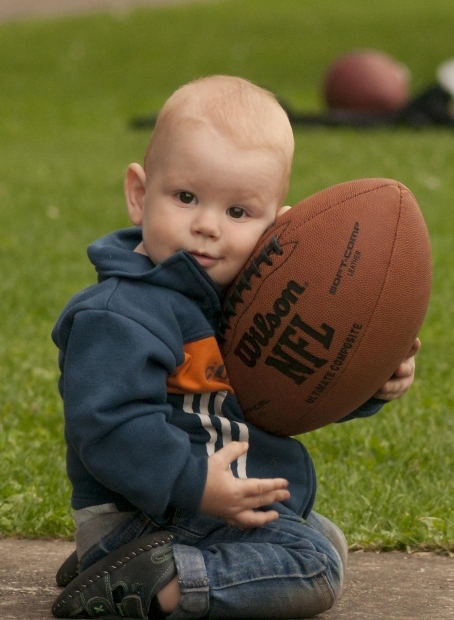 First rule: You have to grow up and be bigger than the football! Watch out, NFL! Image courtesy of Gabor from Hungary, Morguefile. Football, anyone? Tomorrow night, millions of households will be clustered around their TV sets, rooting for their favorite football teams, drinking copious amounts of whatever liquid refreshment is available, and scarfing down everything edible in their households such as buffalo wings, veggie sticks, chicken nuggets, chips, cookies, cannoli and cake. You have to love tradition. There will be tweeting. There will be Facebook comments by the truckload. There will be Instagram selfies from the stadiums, parties and the field. I wonder if anybody will actually count all of the mentions? Probably. I’ve even seen BuzzFeed pictures of massive “snack stadiums” which feature all the foods you’d expect to eat and arranged to resemble a real-life football stadium. I give ’em points for creativity. First ingredient: a LOT of hungry guests. I rather like all the Super Bowl hoopla (I have a joke that most football games are run, fall down, run, fall down, run, fall down — just kidding, people). But my favorite part is the commercials. They make me proud of the creative people in my field — the script writers, the videographers and the others who contribute to the whole experience. As a marketing/advertising professional, I end up critiquing them sooner or later and enjoy reading others’ opinions on what worked and what didn’t. This year’s batch has some good stuff, thanks to my good friend YouTube. 1) Pierce Brosnan/Kia Sorento — I love someone who can make fun of his traditional James Bond image. And the winking owl. Happy Super Bowl weekend, readers! Got any good commercials to share here? What’s been your favorite?